20523 S. La Grange Rd. Print out the game at home, or just download the manual and cards to check ’em out! We’ve offered the game cards in both color and black & white versions, so you can choose how you want to print them. In addition, we’ve sized the b&w versions for either US letter or European A4 pre-perforated business card templates, in case you want to use those! Otherwise, just trim the cards on the lines provided. Files for both fronts and backs of the cards are provided. Hopefully they line up when you print them!! Game manual PDF (spreads) — this tells you how to play! Mission Book PDF — targets created by our Webcomics Pals! Target Intel Sheets — you’ll want to print out some of these for use in making up your own targets and missions. 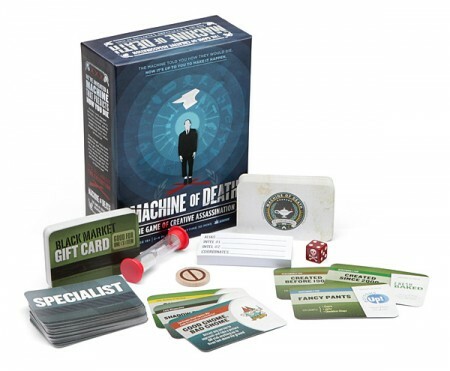 You can also consult our fan-generated Intel Spreadsheet and pick a random target from there, or use the Web App Toolkit at intel.machineofdeath.net! Full color files (fits US letter and A4 both) — This is the complete set of game cards! It’s the only set you need to play the game. Then, if you decide to, feel free to download the bonus cards below to add more variety! Full color files (fits US letter and A4 both) — Fronts only; use the backs from the base game set. Full color files (fits US letter and A4 both) — Fronts only; use the backs from the base game set. Death cards not included — if you want to make more, they don’t really need a template since they’re basically blank on the front anyway. Just print out some backs and write on the reverse. Full color files (fits US letter and A4 both) These contain targets for you to try and kill! You can also consult our fan-generated Intel Spreadsheet and pick a random target from there, or use the Web App Toolkit at intel.machineofdeath.net! 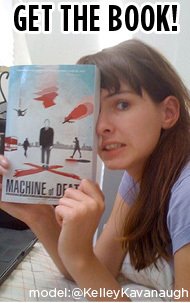 Machine of Death: The Game of Creative Assassination is released under a Creative Commons BY-NC-SA 4.0 license. This permits noncommercial sharing, remixing, adaptation, and distribution of the game and its contents, so long as attribution is given and derivations are released under the same license. If you tinker with our game, we want to hear about it! Send us a note. Check out existing variants farther down this very page! Here’s a very quick summary of the game rules! Here is our ALL-STAR PLAYTEST TEAM running a few rounds of the game! This will give you a good sense of the style of play. NOTE: The final published rules add another wrinkle (assigning difficulty) that isn’t mentioned in these two. This is a video of tiny kittens romping around in a pile of Machine of Death game cards. We encourage checking out these reviews to see if it’s the kind of game you think you’ll like! If it’s not your kind of game, we don’t want you to waste your money on it. We commissioned a bunch of 90-second timer music tracks, for you to optionally use when playing the game! All of this music is licensed Creative Commons BY-NC-SA. Feel free to share the MP3s! Here is a new variant rule, explained! It’s good for people who want to get to playing FAST and don’t mind a little randomness guiding the story you’re telling. As promised in our Kickstarter campaign, we have created a COMPLETE AUDIOBOOK for your use. The audiobook is narrated by Kris Straub, with music by Kevin McLeod. Download all four tracks at Gumroad! My bellybutton is puckering and unpuckering in anticipation of the reveal of the mystery stretch goals now that the campaign is over. When can we expect those glorious secrets to be uncovered? Congratulations to everybody! Can’t wait to play the game. Come on people, the Kickstarter is over and I haven’t immediately received my pledged items via teleportation. What gives? Didn’t meet the $600,000 stretch goal: “Pledged Items Delivered Immediately by Teleportation!” Gotta pay to play.